They thought there was no way you could possibly unmask the sick things they have been hiding. They were wrong. Now, thanks to the incredible revelations in this amazing book, you can discover their innermost secrets. An overview of robots currently in use and prototypes currently being developed provides a whimsical look at how they can be modified to create the perfect robot army. 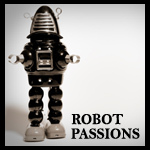 Learn about the history of robotics, from the earliest machines of ancient Greece to modern humanoid robots used by NASA.